Full Moon in Cupid Today Friday. Look at the moon tonight. Cupid is an inner satellite of Uranus. It was discovered by Mark R. Showalter and Jack J. Lissauer in 2003 using the Hubble Space Telescope. It was named after a character in William Shakespeare's play Timon of Athens. It is the smallest of inner Uranian satellites, crudely estimated to be only about 18 km in diameter. 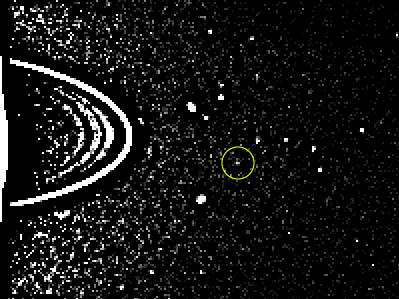 This and the dark surface made it too dim to be detected by the Voyager 2 cameras during its Uranus flyby in 1986. The orbit of Cupid differs only by 863 km from the orbit of the larger moon Belinda. 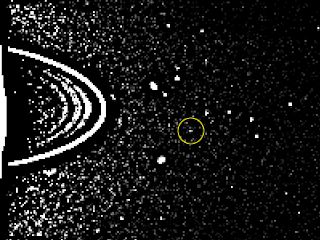 Unlike Mab and Perdita, Uranian satellites also discovered in 2003, it does not seem to be perturbed.